SilverGuard | Cotswold Industries, Inc.
SilverGuard products are developed for the deflection of RFID signals and serve as security for credit cards, health insurance cards, identity cards and other media with RFID systems. 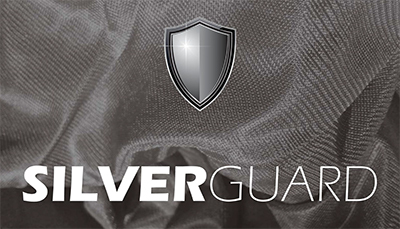 SilverGuard is made with 99% pure silver and therefore is perfectly suited for use in clothing. While other materials, such as nickel, aluminum or copper, can have negative health impacts, silver is uniquely antibacterial, fungicidal, odor-inhibiting, skin-soothing and antistatic. A layer of SilverGuard in a pocket bag is sufficient to achieve complete shielding in all relevant RFID frequency ranges. To learn more about SilverGuard, please view our Look Book.